After a promised time the registration is now open, but first some general info about the cup, the tree layout and finally sign up rules! -Cup is designed for 3v3 layout. -Each team can have up to 5 players on a team, minimum 3. -Cup will last up to 5weeks (up to 5 matches). -Each team will play at least twice in the whole cup due to WB and LB (see tree layout below). -Two map packs will run for two weeks and the third map pack introduced in final. -Map packs consist of 3 maps each. This pictures should make it quite clear. We will randomly pick the teams driving against each other in the first round. [...] This gives you the chance to have at least 2 rounds to participate in! An additional thing here is, that you can still win this cup, even though you lost in the first round. The winner of Block A will in the end battle the Winner of Block B. -Tree filled in using a Cup bracket generator (I just started from the top and filled down the tree). -Match by default set to each Saturday at 6 PM GMT (Subject to change between teams playing against each other). -Total round scores of all 3 maps decide who wins. -Teams should be of minimum 3 players and a maximum of 5 players. -To register a team simply write below what your team name is along with who is playing (in-game names and logins) and I will keep updating this post with the teams. -The person who registers the team is the team leader, this person's responsibility is to contact teams and to ensure both teams can play on Default time and if not to organise a new date and share server details and passwords. Map 1 - "F3C - C3PO by inf." Map 2 - "F3C - reves by Switch"
Map 3 - "F3C - Azimuth. by meNtality"
Map 1 - "F3C - Light us up! by apX. Phoenix"
Map 2 - "F3C - Back To The Routes by apX. Alex"
Map 3 - "F3C - Scrap Attack. by Vendetta." Map 1 - "F3C - Saving Light by shortz.esu"
Map 2 - "F3C - The Last Dancer by Mastermind"
Map 3 - "F3C - Final Flash! by sef.Paras!" Anything I've missed please let me know and i will update and add to first post. Is it allowed to swap drivers after each track? 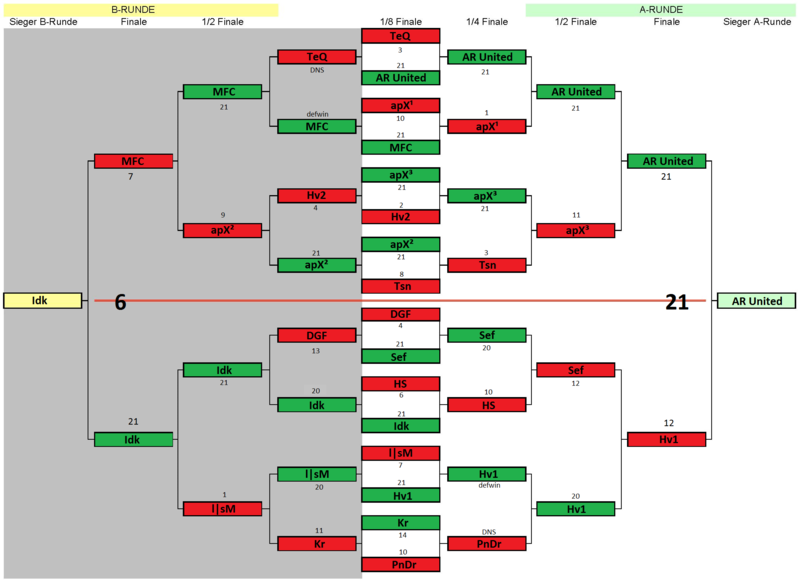 One question: There is only a loser bracket if you lose in the very first round? Not like WTC/GA/ESWC? There was a real loser bracket w/consolation final. I can't find this here. Well if it works like F2C (looks like it) then yes. That makes the result of the first round irrelevant. I think this discussion happened last time as well. @Fredair, Everyone will get to play first round without dropping out, if you lose the second match or any other after then you're out. Only in the first round if you lose you get to still play because you move into the "LB"/B-Runde. Any time after then it's a farewell. Hope that made it clearer to understand. Didn't we already have a discussion that this is not really good? The "B-Runde" most likely has weaker players so you can intentionally lose the first round to have easier matches? I won't drive, but I just wanted to share my opinion. I think it's nice that you're thinking about strategies on how to win, but I'm sure more people will think about this too, so in the end I don't think it matters because if we randomly generated the bracks starting from the 1/4 finals for both sides of the cup we would probably end up with some slightly better teams and some weaker teams on both sides of the cup (A and B rounds) and i honestly don't think all the better teams will purposely win the first round, so the problem of picking a tree sorts itself out as it will all be relatively fair with weaker and stronger teams on each side. I'm sure one of the aAa duos lost the B round and actually won the cup, but I'm unsure about that and I'd need to go back to the F2C threads to see this. e/ it's all for fun anyway so you know, the tree might have a flaw in it but oh well. could be easily fixed by giving the upper bracket a point/map advantage for the final or simply switching a winner and a loser of the first match in the same bracket. this would ensure that a winner of the first round has to play a loser in the second and make the a & b-tree more or less equal. @pro2type, that's a nice idea actually, and it's quite a simple modification to the tree, so i'll edit the tree with some sick photoshop editting skills (*opens microsoft paint*) when I've got access to WiFi again and I'll update the front post of that. i just told the dgf team about it. Are the map packs already finished or is there place for a submission? There's still some time to send in maps, I'm going to be putting map packs together very soon though so that they can be released around 7th September. You can still send it maps in however until the 31st August. Please only contact the leader of the squad you are playing against. First 3 teams registered! Good to see, hope to see more teams sign up! e/ updated the tree layout, hopefully this will make the competition a bit more fair, thanks to Pro2type / seb for the suggestion! Or simply look at my registration.